It may not have been particularly good science fiction but Space:1999 certainly had some nice spaceships. Chief among these, surely, is the iconic Eagle, which featured in every episode and still looks good and plausible today. OK, it's maybe not the ideal shape for something that was regularly seen coming and going from planets with atmospheres, but that didn't particularly bother me when I was nine. This 1/48th model is actually the fourth Eagle that I've owned. 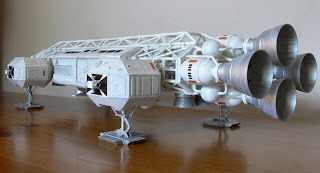 I had two of the Dinky die-cast models which were released around the time of the original series, and later I had the Airfix kit, although I've long since lost the latter. This kit is a half-scale replica of the 22 inch studio model and is accordingly much more detailed and accurate than either its Dinky or Airfix predecessors. In Wales, only the first season of Space:1999 was ever aired. I've still never seen the second, other than clips, which I gather is no great loss, especially as it lacked the fantastic music and opening titles of the first. It always seemed to me that Eagles were fuelled by napalm and sweaty gelignite as they would regularly explode with little provocation. Dragon's Domain, I think - a late series 1 episode, and indeed very scary for its time. Agreed! I was 14. Scared the daylights out of me. I also had the Airfix and Dinky models. One of the Dinkys had the passenger pod and the other a nuclear waste carrier complete with working magnetic hoist. I seem to remember that season 2 was pretty awful because of all the changes they made to try and break the US market. when you said you were 9, I thought that it couldn't be that long ago. then I checked IMDB - 75/76. I was 11 & I wouldn't have thought that I'd remember a show that vividly & fondly from that age. I'm pretty sure Australia aired both seasons, simply for the fact that Nick Tate (Alan Carter), an Aussie, was in it. He was a big name for a couple of years here because of it.